Gives your phone maximum protection from drops, scratches, bangs and scrapes with an industry-leading glass strength of 9H hardness. 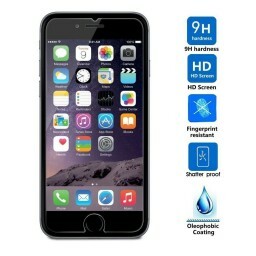 HD ultra-clear rounded glass for iPhone 6s/6s Plus is 99% touch-screen accurate. 2.5D Tempered glass & Anti-broken & HD retina film & Waterproof & Oleo phobic coated & Anti staining & Anti fingerprint. Special Note: Due to the rounded design of the iPhone 6s and 6s Plus and to enhance compatibility with most cases, the ballistic glass does not cover the entire screen.